To integrate with 3dCart, Teapplix requires 3dCart REST API access. 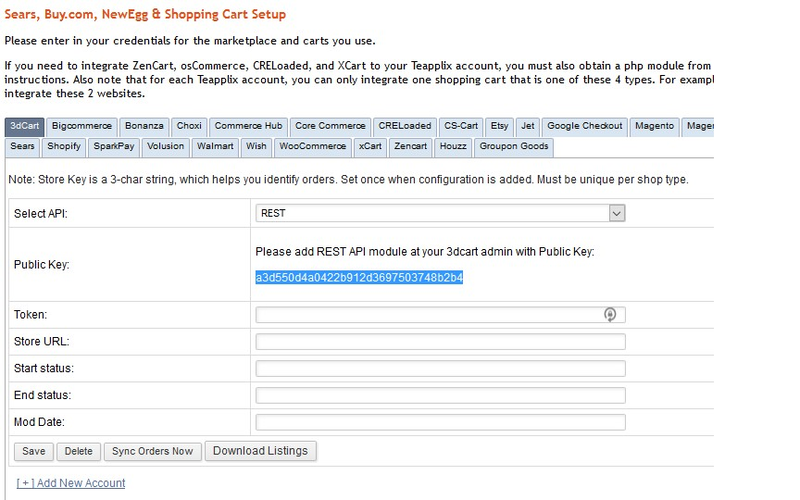 Log into Teapplix; go to "Setup"->"Others"
Select REST API, and copy the Public Key to clipboard. Click "+Add" button at REST API module setting page. At Public Key input paste the clipboard contents and click '+Add' next to input. Authorize Teapplix App to get permissions to Orders And Products. Teapplix will sync with 3dCart every 30 minutes to pull orders and update shipping status. Teapplix can also update the listings on 3dCart with inventory quantity, if you have turned on the InventoryAdvisor and 15-minutes quantity update.